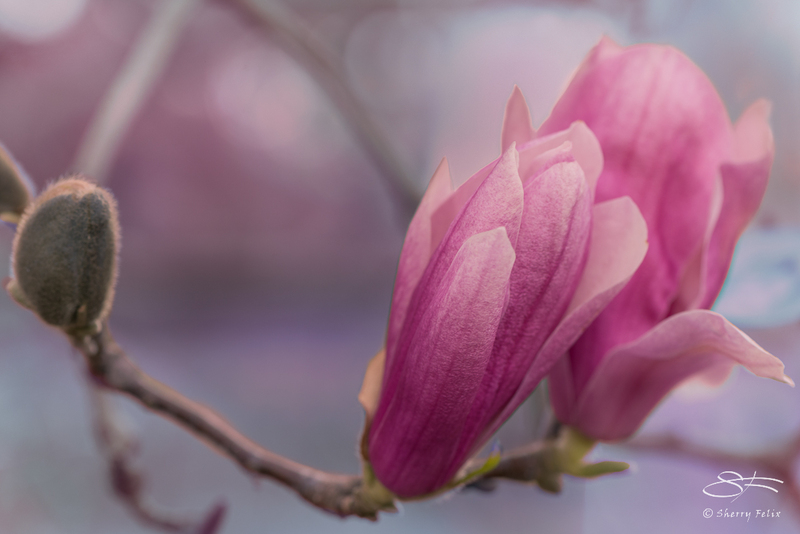 I photographed these magnolias in Central Park March 23, 2016. I like to be careful about what flower photographs I display. I hope these images are unusual or unique in some way because there are so many flower photographs out there. Posted on the After Before Friday Forum week 78 on March 25, 2016. I wanted to bring out the magnolia flowers and use colors in the background that were more complimentary and would look better on my wall. The composition is very important too. 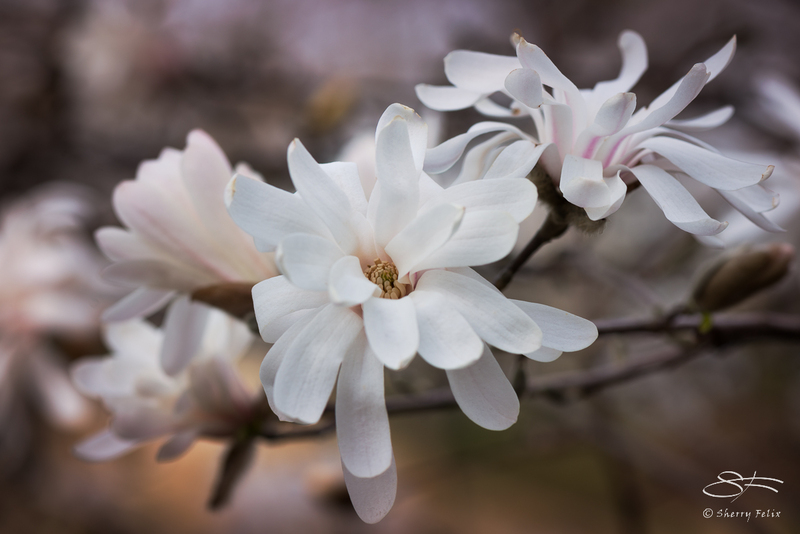 The white Star Magnolias needed a bit of punch achieved in Lightroom and on1. they are one of my favourites! One of my favorote Spring flowers too. I can see why you wanted to tone down the bright area behind the pink flowers and darken the background behind the white flowers to make them stand out. Digital technology provides some great advantages over the old days of film. That is exactly what I wanted to do. In the old days of film they would have used dodge and burn. It would have been hard to change the color though. I love the freedom digital technology provides – no limits. I consider these edits still within the realm of straight photography. If I do a lot of cloning and other enhancements it crosses over into digital art – and I’ll say so. You are too kind – blush. I love how the star mag worked out. I love how it comes forward now. Thank you. You still manage to take some lovely shots and I love reading your posts. When I look at my photos I use my painter’s eye and if some color, contrast or composition isn’t quite right I will fix it – unless the photos was trash to begin with. I sometimes take a photo with thoughts of how I want it to look after processing and to portray a mood. Is GIMP any good for this kinda stuff? It’s free, that is why I ask. I want to learn to ‘fix’ photos, but not enough to buy anything. Any other suggestions would be appreciated! ! Thank you! Sorry can not recommend any free apps, “you get what you pay for”. Lightroom and Photoshop is $9-10 a month and well worth it. Another good suite is Corel Draw graphics suite. I use Corel Painter and used to use the suite. It’s far down on my must have list, hence the not wanting to separate from my $. Thank you for the advice tho!